The past few weeks, this blog has published a few articles about refereeing. Mary Griffith also produced a post-Nationals write up. All of them have provided different perspectives on refereeing fencing. After Nationals ended, I contacted The Fencing Coach and offered to share my perspective as a new referee. I am writing this for a few reasons, but mostly to share the experience of new refs, and some things I believe need to change in order for the referee cadre to keep up with amount of high-level tournament growth in our great sport. Please keep in mind, I am still new, so I don’t know everything that goes on behind the scenes in the various fencing organizations. I hope to offer a fresh perspective on how entering national refereeing looks to new referee. I’ve been reffing since October 2013 when I earned my 8 in epee and 9 in sabre at an ROC. Early 2014, I started working at Chicago-area tournaments. 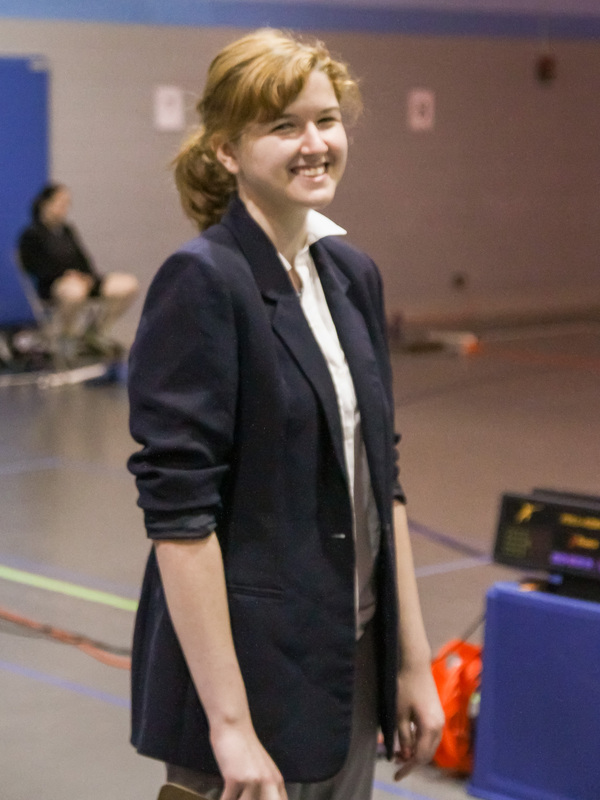 My first national tournament was the March 2014 NAC, where I increased my epee rating to a 6. I followed that with 2014 Nationals, where I earned my 5 in epee (the only weapon I have refereed nationally). Because the Memphis NAC was short-staffed, I was hired on the recommendation of a senior referee, despite having lower ratings than required for national events. The hiring experience was in many ways confusing, and filled with miscommunication. From my experience and others’ stories, I learned newer refs with lower ratings are very likely to be hired as a walk-on. This means that while you will earn per diem and honorarium, USA Fencing (USAF) will not cover your travel, lodging, and other expenses. For me, this meant that I walked out of that NAC at a $150 out-of-pocket loss, even though I shared transportation with fencers and earned the per diem and honorarium. Later, it was suggested that I was hired as a walk-on not because of my rating, but because I could only stay for three days. This is paradoxical: I could only stay for three days because my travel costs wouldn’t be covered and that was how long my ride was staying at the event. I’ve also learned that the term walk-on is used to describe refs who were hired too close to the event, or who literally walked in the door without prior notification. On the Fencing Officials Commission (FOC) website, it is impossible to find information on walk-on referees. While it is a popular and well-known term in refereeing, and certainly a part of the hiring process, I could not find a single document containing that phrase, or a review of what constitutes a hired versus a walk-on referee. Originally, I was simply interested in figuring out exactly why I was hired as a walk-on (since I had conflicting information). Now, I’ve come to realize how unhealthy the walk-on process is. Many national referees have gone through this process. It is the foot-in-the-door thought: “If I pay for this now, my rating will go up, so I may be properly hired later.” Unfortunately, it makes this method of hiring acceptable to the cadre and has become internalized as part of the referees’ development path, even though new refs are likely to be capable, enthusiastic hard workers. Ultimately: new refs pay to work at their first national event. I had a great experience at the Memphis NAC, but as a young college student, it hurt like hell financially. I strongly feel that if the pay-to-play entry into the cadre ended, more referees would be willing to make the step from local to national tournaments. After Nationals, some new referees received unexpected invoices, checks of $4 for six days work, or $50 fees for “referee education days.” In my personal case, I made a mistake, but the problem was solved. With luck, my check will arrive soon and I am grateful to the FOC and USAF for understanding my error. However, it is still questionable that a fair percentage of new refs were hit by unknown expenses. Fortunately, this communication error would be easy to fix by sending out an automated receipt at the time of hire predicting final pay based on the online hiring form. If there is any discrepancy, USAF can fix it long before any event concludes. The other complaint that I have hear about national events was not having enough strong referees. This perceived lack comes down to mentorship. The ratings system in reffing is tough for beginners. Our rating system goes from a P for passing the written exam, to a numeric scale of 10 up to 1 (with 1 being the highest domestic rating), and FIE licenses B or A. In some ways, the system is effective as it provides goals for reaching the next rating. In other ways, it is detrimental to the behavior of referees. It leads to problems with self-advocacy because there is a pervasive thought that you must do everything in order to get that increase: Don’t complain. Don’t say you can’t do something. Don’t show any sign of inability, or ignorance. Quality mentors are key in this environment. I’ve experienced the most growth at national events, where every day, so much more happens to challenge your skills. My peer mentors lineup is too extensive to list, but the FOC has been more subtle. It is entirely possible that they motivated the peer mentoring I received, but I have had trouble identifying their direct influence. The mentorship provided by the FOC needs to be more aggressive and visual. FOC members are ideal mentors as they set the standards for the ratings and are often the most-qualified referees in the room. Good mentorship sponsored by the FOC and USAF would help ease new ref anxieties and protect their interests. For NACs and Nationals, it would be beneficial to create an official position where high level refs would act as mentors for the day (rather than reffing or assigning). They would spend their entire time giving written observations and critical feedback. A person who had this position would be completely available to questions from refs and accountable for advocating on the behalf of newer referees. I believe a position like this is necessary because mentoring needs to be top-priority, and at times it was lost in the shuffle of trying to smoothly run these large events. Additionally, there is a per diem of $20 for days of travel and days off during the tournament as a meal allowance. If we do the math, on a working day the list turns into: 1 & 2, A & B, and FOC representatives, $130; 3, $95; 4 & 5, $75; 6 through 10, $50, and $105 for other volunteer officials. This affects refs in two ways: 1. It creates a morale problem; and 2. It provides a dis-incentive for referees to spend their time at national events. It’s a no-brainer that an increase in pay would attract more people to improve their refereeing nationally. Why ref a NAC or Nationals when a local high school tournament where hand-signals are optional, rating not required, pays $100 or more for a shorter day? At the very least, I believe that we should follow the Canadian system, and provide overtime payment for those who work more than 9 hours a day. That shouldn’t be just for referees, but also for the other volunteer officials. This would make those long days and nights much more bearable for everyone. Despite these frustrations in refereeing fencing, I absolutely love it. It’s fun. It’s challenging and almost everyone has been kind, humorous, and supportive. I want to emphasize that no single person, FOC or otherwise, has been personally rude to me and my complaints are organizational in nature only. The system may be flawed, but I’m optimistic for change over the coming seasons. Whether that comes from policy changes instituted by the USAF national office, the FOC or from the fencing community at large (it will probably take all three), I have faith that we can find smart solutions. Great post. I see a lot of parallels between your description of being a new referee and the adjunct system at universities. I’ve never believed in job security via tenure. Unofficially, a ref who has been at the game for thirty years is more or less “unfireable.” Professors AND referees should always be held accountable for poor performance. This is why I’ll stick with being on the armory crew…our pay scale seems a lot easier as it’s not based on our certified level (if we have one)…the head tech gets paid more, but everyone else on the crew gets the same rate, if I remember right. I DO remember coming home from Portland JOs with over $500. Pretty sure first-timers have to pay their own way….the guy next to me at JOs did. I was fortunate that my first national-level event was Summer Nats in Anaheim and I could drive there, so the cost was minimal….now I’ll be covered if I get on a crew again.